Our mission at Horses for Healing is to provide horses as therapy for children and adults to help facilitate growth, learning and healing. Horses for Healing is dedicated to enhancing the physical and spiritual well-being of special needs individuals and their loved ones through involvement with horses. 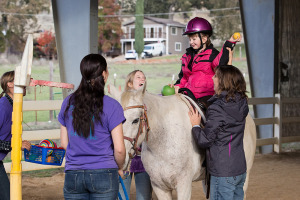 The purpose of our program is to provide therapeutic horseback riding experiences that enhance social and emotional functioning, as well as motor skills for children and adults living with physical, cognitive and psychological disabilities. Horses for Healing is a volunteer-run organization. Clients learn to ride and care for our horses in a beautiful, peaceful environment. Our instructors are certified by PATH International. They work with each client to set goals and develop individualized lesson plans to achieve those goals and improve balance, strength and flexibility using a fun form of physical therapy. Volunteers help provide safety, stability and a sense of security for clients as horse handlers and side walkers. Clients with physical mobility limitations feel a sense of empowerment. Special relationships between client and horse provide a sense of personal responsibility and accomplishment. Clients with sensory challenges are introduced to elements that promote enhanced sensory integration. Our horses also benefit from working in a therapeutic riding program. Herd animals by nature, they want to be part of a group whether it be with other horses or humans. Both clients and horses experience joy, a calming effect, and learn to understand each other’s cues from the bond that develops between them.